Taylor & Co Master Goldsmiths. Independent jewellers in Crowthorne, Berkshire. 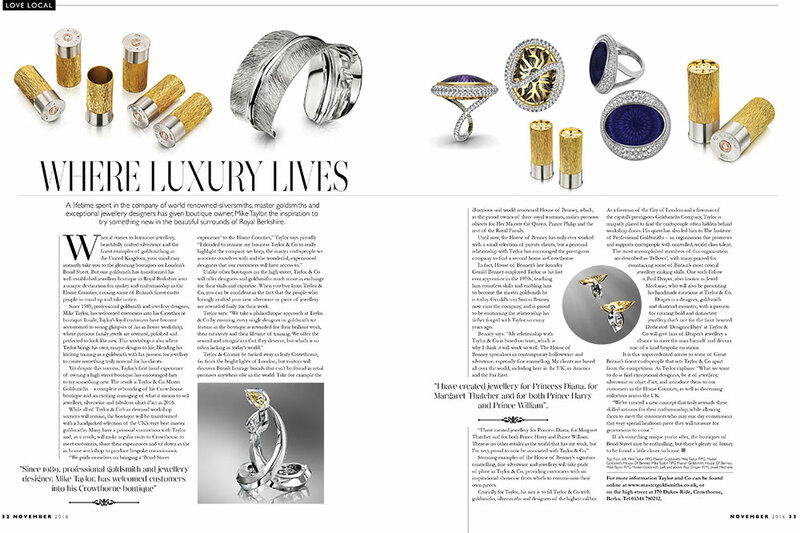 Featuring a selection of handpicked UK master goldsmiths and designers. To introduce the innovative sales concept used by Berkshire retail brand Taylor & Co to local consumers through commercial content in regional luxury media. An advertorial feature article (suitable for a double page spread) to explain the brand’s vision, products and values in an engaging and authentic way. A clear and concise press release announcing the launch of Taylor & Co Master Goldsmiths geared towards consumer publications. An engaging cover letter to approach consumer magazine titles with an invitation to a VIP launch event. In order to understand Taylor & Co Master Goldsmiths, both as a retailer and an innovative business, The William Agency spent a day at its concept boutique in Royal Berkshire. This one-on-one experience allowed our editorial team to create a tailored advertorial feature, which was later printed across Fish Media Group’s Life Magazines portfolio (distributed in and around the Berkshire area). The William Agency is rooted in quality journalism. We undertake rigorous research to create features for advertorials, magazines, and websites, as for Taylor & Co Master Goldsmiths. Our expert journalists cover the complete feature writing process, from researching trends and conducting interviews, to writing engaging and effective copy to meet and exceed your needs. Find out more about our expert feature writing services and get in touch to discover how our #wordclass writers can support you. The William Agency works with a range of clients to create effective PR strategies, encompassing press release writing, liaising with journalists, pitching features, organising events and media buying. We specialise in B2B PR, but our experience also includes consumer PR, social media influencer marketing and many other media services. Find out more about the variety of PR & communications services we offer and get in touch to discuss how we can work together.